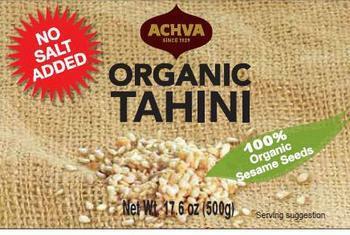 Achdut LTD of Ariel, Israel, is recalling all packages and sizes of its tahini products produced from April 7 to May 21, 2018. The firm is collaborating with health officials in connection with a positive finding of Salmonella in a U.S. import sample of Achdut Tahini linked to a Salmonella outbreak that is currently being investigated. Tahini, Whole Tahini, Organic Tahini and Seasoned Tahini. Container sizes: 15oz, 16oz, 17.6oz, 635 oz (428g, 454g, 500g, 18Kg), with lot numbers 18-097 to 18-141 or with expiration dates April 7th to May 21st 2020. The brand names of the products are: Achdut, Baron's, S&F, Pepperwood, Soom and Achva. Consumers with questions may contact the company at 972-3-9068020, Sunday – Thursday 8:00am – 5:00pm (GMT+2).